Lexington Pointe, a new community that puts residents within walking distance of Des Plaines’ active downtown. CHICAGO—Americans no longer prefer to live in spread out suburban communities. Instead, walkable urban neighborhoods have become popular, both among millennials and baby boomers looking to downsize, according to a report from the Regional Plan Association, a New York-based research and advocacy group. But this demand is having an impact far from the nation’s urban cores. Suburban developers and municipalities also sense opportunities. Transit-oriented developments clustered around suburban train stations can offer lifestyles, and access to jobs, similar to those near a major CBD. But the supply of new-construction, for-sale housing in such areas is limited. Some Chicago-area homebuilders, however, have launched for-sale TOD projects in the heart of several suburban downtowns. 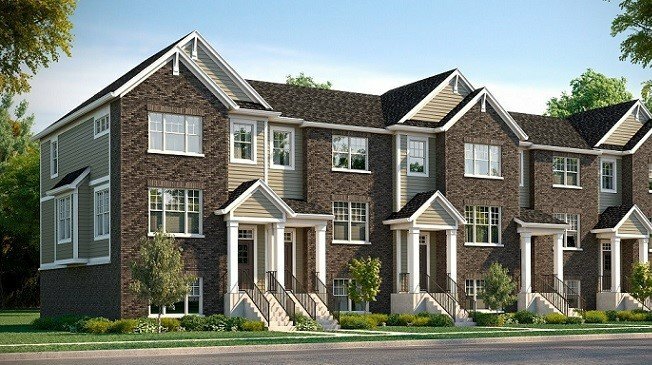 Lexington Homes, for example, recently began sales for Lexington Pointe, a new community of 58 townhomes in downtown Des Plaines. Located at 781 Lee St., the community puts residents within walking distance of the Des Plaines Public Library, post office, coffee shops, automotive repair shops, churches, a yoga studio and fitness centers. And commuters have a short, two-block walk to the Des Plaines Metra station and a short drive to I- 294 and I-90. The company also recently launched Lexington Towne at Arlington Heights, a new community of 15 luxury single-family homes in downtown Arlington Heights. The town was named in a recent Daily Herald survey as “Best Place To Live” in the northwest suburbs with the “Best Downtown Atmosphere.” Residents will have easy access to a wide variety of upscale restaurants, shops, boutiques, art galleries, theaters and Arlington Heights’ performing arts center, all a short walk from the Metra station. as well as recreation like parks and an indoor swimming center. Located at 909 W. Campbell St., Lexington Towne offers four floor plans, with pricing starting in the mid $700,000s. “To find new, luxury single-family homes in a well-established, in-town location like downtown Arlington Heights is very unusual,” says Benach. Foxford Communities broke ground this summer on Foxford Station, the first transit-oriented development of its kind in Western Springs. Located at the corner of Wolf Rd. and Burlington Ave., the four-story building will include 3,600 square feet of first-floor commercial space and condominium residences on floors two through four. The company expects to welcome its first move-ins in late 2018, and has seen interest from both millennials and baby boomers.